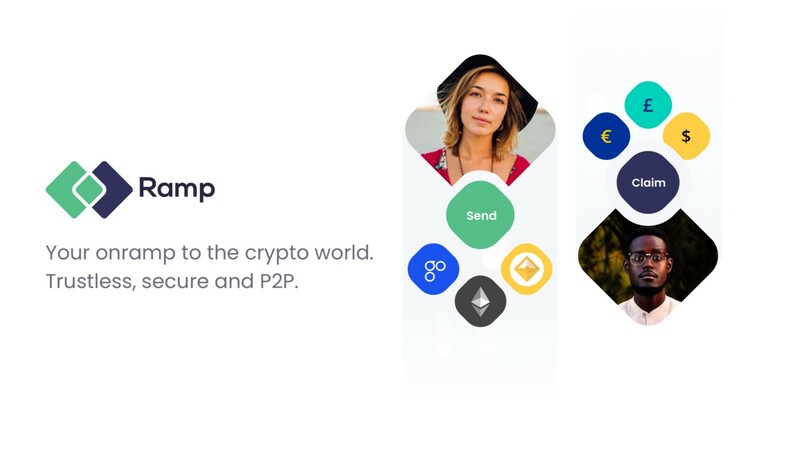 Hello from Ramp, a company dedicated to building a fiat-to-crypto onboarding system for the next billion crypto users. Millions of users around the world own some crypto and this is great! But are we ready to accommodate the next billion users? The irony is that most of those early adopters had to use a trusted third party to get onboarded to the trustless, decentralised blockchain ecosystems. Today, most people settle for centralised exchanges because of ease of use. However, the price for convenience is high. Exchanges have become the chokepoints between the world of centralised and decentralised finance. When cryptoassets are held on an exchange, all of the advantages of decentralisation — security, privacy, censorship resistance — are lost. Tokens have been transformed into I.O.U.s of the custodian. If you want to transfer assets between two public blockchains, it is possible because of their open nature — you can set an atomic swaps. The reason we don’t have an easy to use fiat-to-crypto settlement system, which would be independent from centralised third parties, is that access to the financial system is inherently closed — there is no Infura to your bank. This is changing, however, and Europe is leading the revolution. Under new EU-wide directive (PSD 2) any customer of any EU bank can ask their bank to open their underlying infrastructure and information to third-party financial service providers. We are excited to see that governments around the globe are introducing open banking initiatives of their own, including Japan, Hong Kong, Singapore, Korea, and Australia. Open banking developments allow for the first ever banking oracles, which make it possible to hook up banks’ ledgers to open distributed ledgers. This means that it is no longer necessary to use a centralised custodian to settle fiat-to-crypto trades. With Ramp, buyers and sellers no longer need to send their fiat money and cryptocurrency to an exchange choke-point in order to move value between the two worlds. They will be able to directly settle between each other. As safely as using decentralised, P2P exchanges. As conveniently as using current state of the art centralised exchanges. We are thrilled to announce our proof of concept app, Ramp Swaps, that allows for trust-minimised, P2P swaps between fiat and crypto. It is the first step on our journey to a world where money flows freely between open and closed systems. We’re offering a working, open tool; not a mock up, not a closed beta. You can try it now, only thing you need is a UK bank account. We’ll soon roll it out to the rest of the EU. Even though we believe Ramp Swaps is a great product for many use cases, it is just a baby step. Right now it is centralised and only allows you to execute pre-arranged transactions. However, we believe that settling fiat to crypto transactions without a custodian is the hardest part of creating a secure, resistant solution that competes with today’s crypto exchange behemoths. We want open, distributed systems to succeed worldwide. Our goal is to realise this future by empowering everyone to participate in open networks. With our technology we believe that we can onboard millions of users over the coming years — and this is only the beginning. Before getting into building open networks, we were working to substantiate the same vision. To build Ramp we have assembled a diverse and motivated team with tech, exec, and legal backgrounds. Our experience ranges from tech startups to international corporations, Google to BCG Gamma, and Clifford Chance to Société Générale. You can read everyone’s bio here. Buy crypto easily. Always your funds. Ramp is crypto onramp done right.